The Magellan spacecraft orbited Venus from August 10, 1990, until it plunged into the Venusian atmosphere on October 12, 1994. Magellan Mission objectives included (1) improving the knowledge of the geological processes, surface properties, and geologic history of Venus by analysis of surface radar characteristics, topography, and morphology and (2) improving the knowledge of the geophysics of Venus by analysis of Venusian gravity. The Helen Planitia quadrangle (V-52), located in the southern hemisphere of Venus between lat 25° S. and 50° S. and between long 240° E. and 270° E., covers approximately 8,000,000 km2. 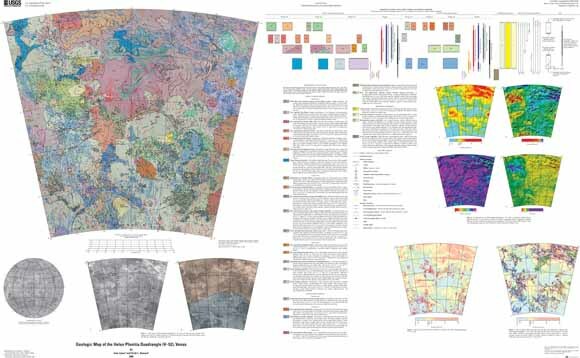 Regionally, the map area is located at the southern limit of an area of enhanced tectonomagmatic activity and extensional deformation, marked by a triangle that has highland apexes at Beta, Atla, and Themis Regiones (BAT anomaly) and is connected by the large extensional belts of Devana, Hecate, and Parga Chasmata. The BAT anomaly covers approximately 20 percent of the Venusian surface.